We woke up this April morning to a blizzard. It is as beautiful as it is surprising. After walking the dogs for their morning constitutions, I shoveled the driveway and cleared the walkway to the house – more for the dogs than for Mrs. tVM and me, for we have no intentions to use the vehicle today. I suspect I will repeat the task throughout the day, although my friend Steve across the street will make short work of it with the snow blower Larry bequeathed to the neighborhood. As I enter the house after completing the task, Clarence meets me at the door with wagging tail ala Caesar, Cooper and Hans whenever we entered the house in Tucson. I used to refer to Caesar as the ‘bucking bronco’ he was so happy. Clarence rises to my arms and I lean forward and hug him. He licks my face. It is as pure an expression of love and joy as any creature can spontaneously give. Hans would do the same, but at 15-years old, he’s not as spry and mobile. “I love you,” I tell my dog as I hug him. “I will always come home. I will never leave you.” He settles down and I give Clarence and Hans each a cookie. 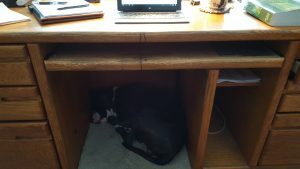 As I write, Clarence rests comfortably under my desk softly snoring. I think of all the times people enter the house and Clarence runs up to greet them the same way he greets me. It is the BEST way he knows to express his love and joy. But when he does, everyone sternly says, “Down, Clarence, get down.” The thought is bittersweet that we should tell a creature of God to repress his natural tendency to want to love another creature and to express that love. Mrs. tVM comes upstairs from her Bowflex workout. 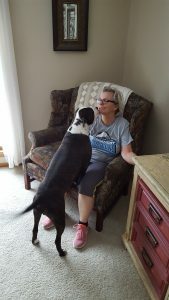 Clarence immediately runs to the bedroom to let her know he loves her, too and is happy that she is his second-best friend. His tail wags so rapidly that it is blurred! Great photo of two beauties!